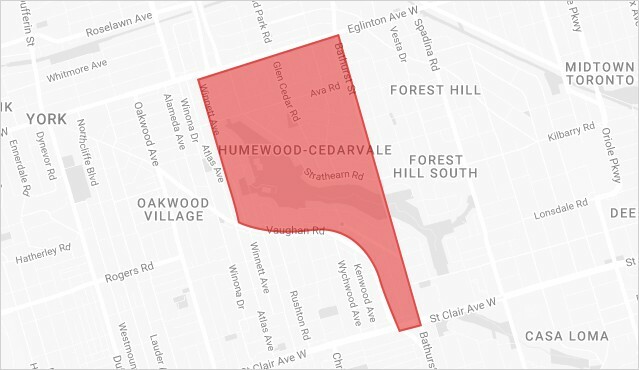 A few years ago, Cedarvale was a hotspot for first-time buyers and young families wanting to live close to downtown with easy access to public transit. Today, it still is, although it’s also attracting a group of more mature buyers who are renovating many of the neighbourhood’s 80+ year-old homes. With the impending arrival of the Crosstown LRT, the Eglinton retail strip between Bathurst and the Allen Road expressway is sure to become rejuvenated. Recently, the first independent café and boulangerie arrived on the scene, joining the busy Starbucks and Timothy’s coffee shops. It is anticipated that more specialty food and restaurant establishments will take up residence very soon. The new transportation system is sure to give these businesses a major boost by delivering patrons east and west across Eglinton with ease. As for shops and services, those that are family-oriented tend to do well in and around Cedarvale. You’ll also find many eateries that cater to the needs of families. With condominiums starting to pop up along Eglinton Avenue West and density subsequently increasing, new shops and restaurants will undoubtedly be attracted to the area. When it comes to parks and recreation, Cedarvale scores well with its community centres, libraries, skating arena, Glen Cedar Park, and beautiful Cedarvale Park. The latter boasts a fabulous multi-use recreational space that includes playing fields, tennis courts and the Phil White outdoor skating rink and indoor ice arena. From tobogganing, tennis and baseball to kite flying, bird watching, frog finding and day camps, the park has something for everyone. Even four-legged family members have their own, off-leash area. With its traditional and modern recreational facilities, Cedarvale Park is a progressive urban green space that ought to serve as a model for urban parks across the city. Want to learn more about Cedarvale? Let’s talk. Residents of Cedarvale can easily access the Yonge-University subway line using the Eglinton West station. Vaughan Road and Bathurst Street bus services connect passengers to the St. Clair West and Bathurst subway stations respectively. There’s also the Eglinton West bus that stops at both the Eglinton West subway station and Eglinton subway station. Three to four years from now, the Crosstown LRT, currently under construction, will ease east-west movement across Eglinton Avenue. For drivers, the Allen Road expressway can be quickly accessed at Eglinton Avenue. This feeds into Highway 401 and its network of commuter highways. For convenient access into the core of the city, Bathurst Street is usually a safe bet.